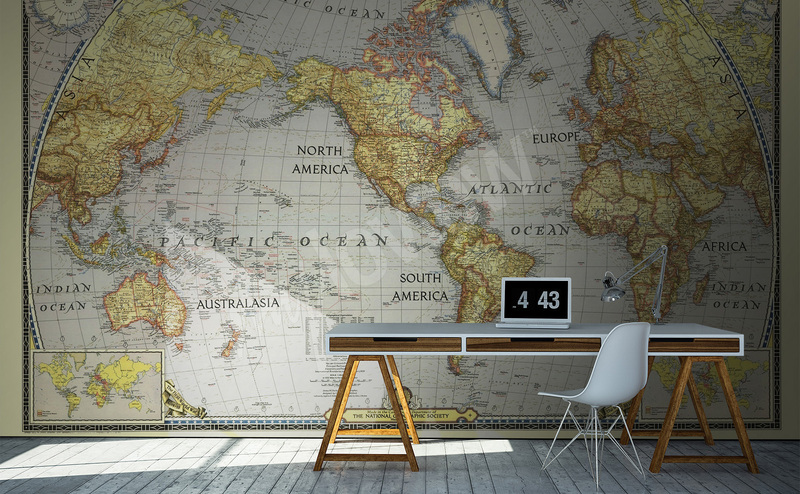 A world map mural is a great idea to arrange an interior occupied by a true fan of travels. A large format map will not only remind us of our past travels. It will also become a source of inspiration for planning more journeys all around the globe. Depending on the decor, we can choose a different type of mural for our room. A political world map mural in retro style will look great in a traditional interior. On the other hand, a world map mural depicting just the outline of the continents will fit a minimalistic decor. So, let’s go on a short trip and see what other types of world map mural we could apply into our living room. 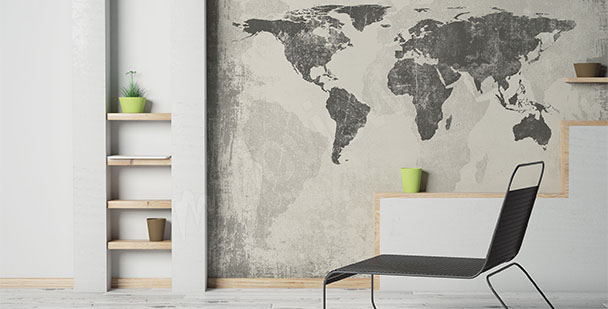 A black and white world map mural is a versatile decoration for any space. Perfect for a low-key living room. 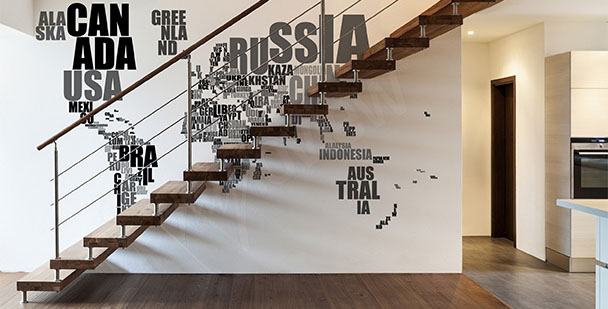 This mural featuring a minimalist take on the map of the world is a perfect complement to modern interiors. A world map makes a perfect wall decoration for a children's room. Colourful animals arranged in the shape of the continents bring the design to life. 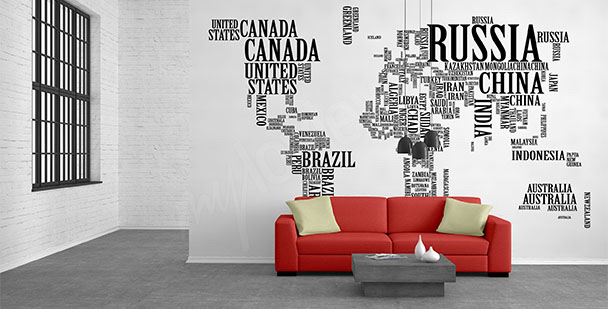 A mural with the names of countries arranged in the shape of a world map is an unusual idea to add interest to a wall. 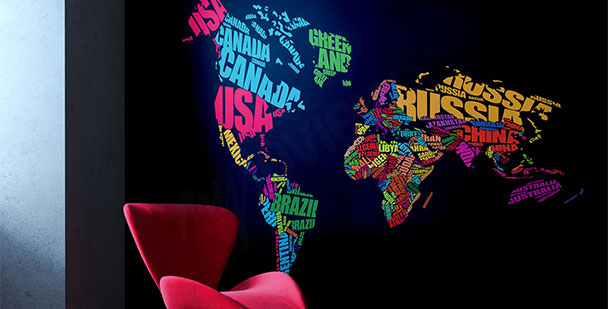 Bold and full of colour, this mural with a modern take on the map of the world will become the focal point of your room. Are you a fan of old-school decorations? Then why not to choose a vintage-style map mural! This design will transform interior, creating an atmosphere of a bygone era. A mural for a children’s room must stimulate their development! 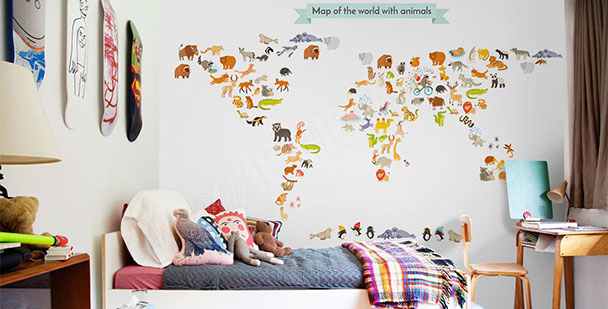 This wall decor featuring animals arranged in the shape of a map achieves this objective. A map made up of black inscriptions is an ingenious and modern wall decoration. Are you a fan of the eclectic or colonial style? 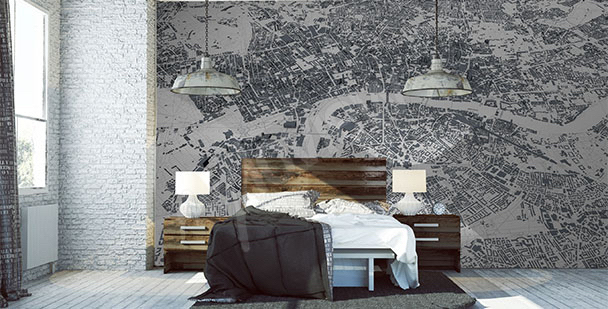 Then this old-school map mural is a perfect choice! The raw industrial style is all the rage in interior design these days! A mural featuring a modern map complements it perfectly! 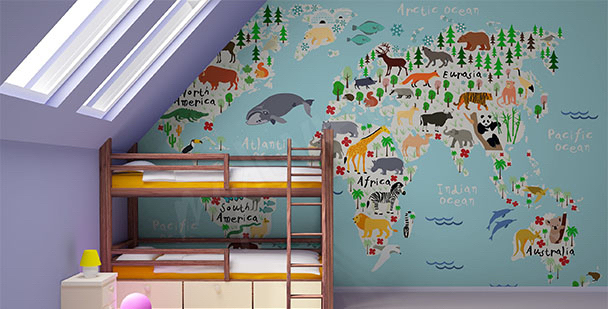 This mural with a colourful map will turn your child's room into a cosy space for rest and play. A colourful wall map will take your children to the world of dreams and adventures! It looks best by the bed. 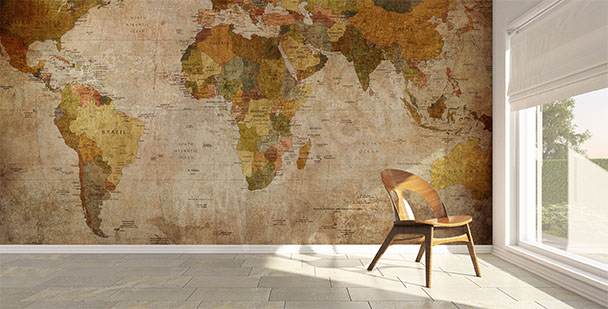 A world map mural is just an ideal offer for an interior designed in a colonial style. Colonial style was created in XIX century and was an effect of travels to faraway and exotic lands such as Asia or Africa, taken by the Europeans, and especially - the English. As a result of those months-long journeys, the settlers started to arrange their quarters with imported, classic English furniture combined with local elements. The colonial style has stood the test of time and is still a quite popular. In this type of interiors, an Australia map wallpaper, or one with Asia or Africa, will correspond well to the color scheme of a toned decor. Various shades of yellow, brown and green will go along well with cream-colored walls, leather couches and wooden furniture. An old map mural, similar in appearance to original XIX century maps, will also fit such an interior. While selecting map murals for a continental living room, it’s worth to complement an interior with one more element- an antique globe in the same style as the wall mural. While appreciating an incredible beauty of foreign countries, it’s worth to emphasize our dedication to our fatherland by choosing a unique living room decoration. England map wallpaper or USA map wallpaper won’t be just a decorative element. Applied on the main wall of our interior, it will create an essential decoration that will emphasize our respect for the country we live in. Depending on the style dominating our interior, a world map mural may take a different form. A simple outline of a country in a modern interior will look just as good as a multicolored, origami-like composition. On the other hand, a map mural filled with a folk floral pattern will be a perfect fit for a traditional or rustic bedroom. A political world map mural will be a perfect decoration for a schoolchild’s room. Thanks to it, a child will quickly learn the basics of geography. It’s worth to choose a design, that will not only be practical, but also attractive for a child. 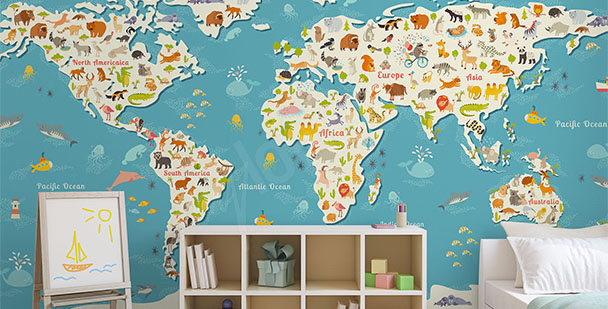 World map murals for kids will look great in form of a funny cartoon illustration, that, aside of teaching them about the world, it will be an inspiration for a play time. On the other hand, a world map mural in retro style will remind your children of pirate treasure maps, and inspire them to come up with new games every day. 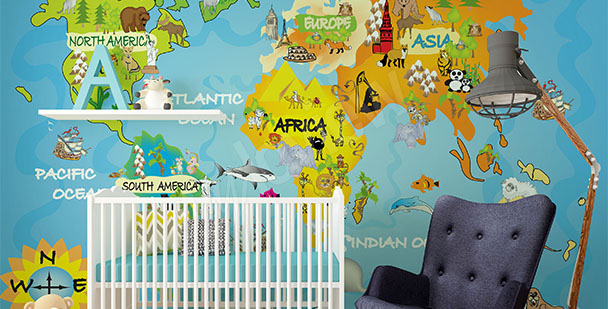 World map murals for kids don’t have to be boring. By choosing an interesting, colorful motif we will not only instill in our children love for learning, but also for travels and discovering the world. Map murals are also an interesting offer for modern interiors, characterised by an economic decor and minimalistic space arrangement. This type of a living room will look great when decorated with a political world map mural with an original, geometric look that resembles the art of origami. Colorful continents will enliven a space while maintaining an economic character of an interior. Another interesting option is map mural of Europe, that looks like a model with flags marking some of the countries. Such three dimensional presentation will additionally give an effect of depth and will make the room seem bigger. A mural with a map is also an interesting idea to decorate a kitchen. A mural that fits the color and style of a decor will not only be a stylish decoration. Some of the regions or countries will inspire us to search for new flavours and to prepare dishes from all around the world. Additionally, map murals 3d will optically enlarge a small space of a kitchen.